A Virginia man accused of shooting into Herndon office buildings worked for one of the companies he's accused of shooting at, court documents reveal. The documents also claim the suspect, 29-year-old Matthew Charles Malacarne, was driving around with a virtual arsenal in his car. Malacarne was arrested late last month in the shootings. From late July to September, windows at several office buildings were shattered by gunshots during overnight hours, alarming workers who discovered broken glass the next morning. There were seven incidents in all, spanning from Herndon to Leesburg. Most of the targets were tech companies off the Dulles Toll Road, although two banks were also hit. Search warrant documents describe Malacarne as a "low level" employee at ManTech. That company's Herndon office was hit twice. Malacarne is also suspected of damaging a rooftop satellite. The documents reveal Malacarne had the weapons and ammunition to do far more damage than he's accused of. 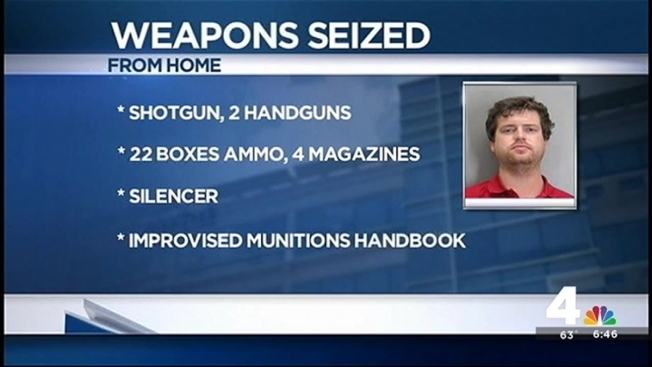 Investigators said they seized a shotgun, two handguns, 22 boxes of ammunition and four magazines from Malacarne's Herndon home, according to the documents. They said they also found a silencer and something called the "Improvised Munitions Handbook." Inside Malacarne's car, authorities say they found an assault rifle loaded with three full magazines, a rifle, a handgun, 10 boxes of ammunition and three more magazines. The investigation shows, however, that most of the bullet holes in the buildings seem to come from a small-caliber weapon, not the assault rifle. Malacarne was buying new weapons as recently as Sept. 5, the documents show. Court documents say Malcarne was finally identified as the suspect after he drove into the ManTech parking garage Sept. 17 and struck the surveillance camera, causing it to to go blurry. He broke into a lock box and stole a key to the roof, the documents say. Authorities believe he then cut the power to the elevator, and disconnected and damaged a satellite dish. Another security camera captured images of him leaving in a silver Audi. A few days later, the building engineer saw the same car leaving, with Malacarne behind the wheel, and made the connection. Fairfax County Police say they can't comment on the new details because their investigation continues. So far, a potential motive in the shootings is unknown. A detective wrote that he's "learned of no explanation for Malacarne's sinister behavior."